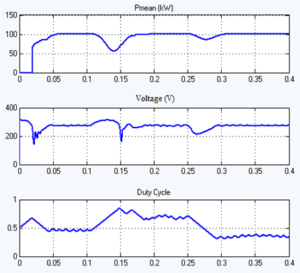 This study analyzes various anti-islanding (AI) protection relays when the islanding condition of Grid-Tied PV (photovoltaic) System appears at the Point of Common Coupling (PCC) between the PV Solar Power System and the power grid. The main purpose of the study is to determine the performance of several AI prevention schemes in detecting the presence of an island, by monitoring the detection time of the islanding condition through different methods. The devices used to implement the methods include over-current and under-current (OI/UI) relays, over-voltage and under-voltage (OV/UV) relays, over-frequency and under-frequency (OF/UF) relays, rate of change of frequency (ROCOF) and Vector Shift relays. The protection was tested in case of complete disconnection of the PV system from the electric power grid and also in case of various grid faults. Fig. 5. 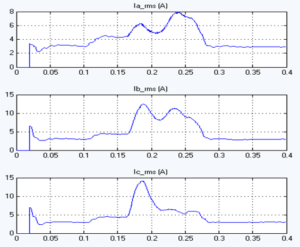 Simulation result in 20kV measurement point of utility grid. Fig. 6. 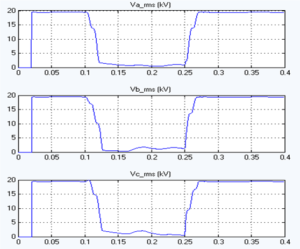 The RMS value of voltage in PCC. Fig. 7. The RMS value of current in PCC. Fig. 8. 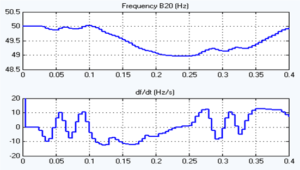 The output result of frequency in PCC. in significantly better performance in respect to detection time of islanding conditions. 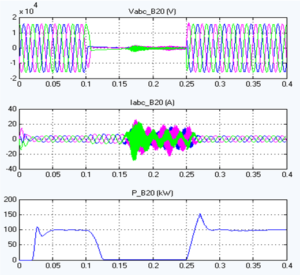 The ROCOF and Vector Shift relays have a detection time comparable with frequency relays. However, if the ROCOF threshold is exceeded, the formation of an island is quickly detected. 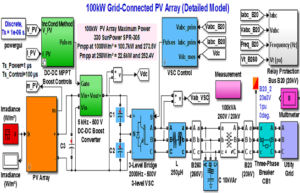 The terminal voltage of PV inverter needs to exceed a certain threshold when the frequency is not stabilized by VSC. 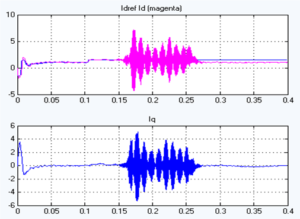 The UC relay failed entirely to detect the islanding in both analyzed cases. The effects of unintentional islanding were observed from simulation of transient grid faults on a power distribution network. The protection equipment needs to distinguish between islanding event and grid faults. The Grid-Tied PV System protections should detect the fault and trip before islanding occurs as a result of the opening of the circuit breaker in response to a downstream fault. In order to minimize these effects and to perform according to the. international standards, the AI relays have to be inserted at the points where islanding conditions may occur. The theoretical simulation results are useful to select these points and design the AI protection devices for Grid-Tied PV Systems. D. Rekioua and E. Matagne, Optimization of Photovoltaic Power Systems, Modelization, Simulation and Control. Springer, 2012. R. Teodorescu, M. Liserre and P. Rodríguez, Grid Converters for Photovoltaic and Wind Power Systems. John Wiley & Sons, Ltd., 2011. CIGRE Working Group B5.34, “The Impact of Renewable Energy Sources and Distributed Generation on Substation Protection and Automation,” CIGRE, 2010. This entry was posted in Blog and tagged 2016/2017 IEEE electrical projects for BTech/MTech, A Study on Anti-Islanding Detection Algorithms for Grid-Tied Photovoltaic Systems, Academic electrical projects for BTech/MTech, Anti islanding detection, B.Tech Final Year Projects, B.Tech Projects, best EEE projects, BTech/MTech electrical projcts, Final year electrical projects for BTech/MTech, grid connected system, IEEE electrical projects for BTech/MTech, IEEE Power Electronics and Drives Projects, IEEE Power Electronics Projects, IEEE power System Projects, IEEE Projects, islanding system, Latest 2016 IEEE Electrical Projects, Latest 2016 IEEE Power Electronics and Drives Projects, Latest 2016 IEEE Power System Projects, latest electrical projects IEEE, M.Tech Final Year Projects, M.Tech Project, Major electrical projects for BTech/MTech, MATLAB/Simulink Electrical Projects, MATLAB/SIMULINK projects for BTech/MTech, mtech power electronics projects for BTech/MTech, mtech power systems projects for BTech/MTech, photo voltaic system, Readymade electrical projects for BTech/MTech, renewable energy and systems projects for BTech/MTech, topmost ieee electrical projects, wind energy projects for BTech/MTech. Bookmark the permalink.